It’s easy to beat the sun awake in the tropics. Or anywhere in the winter. Is this balmy breeze stirring palm leaves to dance and sing a sign of winter? Today’s the day. It’s time to say goodbye to Paradise and return to the reality of home. For whatever reason, that reality involves a winter storm advisory. Because after enjoying shorts weather for five days, it’s only fir to return to sub-freezing temperatures, icy roads and the wintry mix the Pacific NW is famous for–when the regular deluge gives way to colder weather. Every morning we enjoyed a walk, either along the beach or through the quieter, sleepy streets. There won’t be any of this once we get back to the mainland. Who wants to get drenched in the name of walking outside? Perhaps everyone has a different concept of Paradise. In the Bible, it could be the Garden of Eden or a place in the center of the Earth where souls waited for release. In my world, it’s a place where the days are sunny but not hot. Where the only thing on my schedule is whatever sounds good. Where I don’t have to wear socks and shoes. And the pace of the day reflects my mood. There are palm trees. The sky is a crystalline aquamarine, the color of my Caribbean blue diamond. Maybe it’s a blue topaz sky since it’s December. Waves lap against the soft shores. The briny smell of the sea underwrites a sweet aroma of baked goods. And there are no calories. At least in my mind. Is there any song so mournful as “Taps” when a bugle plays the cadence? It suits the mood. It’s the perfect way to say farewell. There’s an end, so we say goodbye. Which also means there’s a beginning. It’s an ocean away in a colder place. Pine trees will carpet millions of homes with their needles. The voices of Andy Williams and Bing Crosby have even reminding us of the season when the flush of sweaty beneath sunny rays lent to amnesia. Seats are reserved on a flight. Cats wait our arrival thousands of miles away. There will be a hello. Those Hawaiians knew what they were doing. Aloha means hello and goodbye. Because in this temperate land of sweet pineapple and aromatic coffee, they’re really the same thing. What is a holiday – really? A holiday is when you don’t have to go to work. If that is the true definition, every person who is retired from employment, or unemployed, experiences a holiday each and every day of the year. Ah, yes. A holy day. Something specific to religious celebration and thus not politically correct to address in polite conversation. As you’ve long suspected, political correctness falls further down my list of priorities than simple straightforward honest expression. As for days of religious significance, I would mark three: Christmas, Easter and Thanksgiving. In my mind, all three of these days draw special attention to the One in my world to whom I ascribe deity and offer worship. In honor of political correctness, I want everyone to understand these dates reflect my personal opinion and aren’t meant to infringe on anyone’s freedom to disagree. Even though Christmas, like almost all “holy days” on our traditional calendar, has pagan roots, I consider it the day to honor the birth of Jesus Christ. He is a historical figure so my celebration of his birth should be no more offensive than honoring February 12 as Abraham Lincoln’s birthday. In my world, this date involves revisiting the account of Christ’s birth as recorded in the Gospels of Matthew and Luke. This generally happens in the wee, dark hours of December 25. Afterwards, my family does paganistic things like opening Christmas stockings and unwrapping gifts beneath the twinkling lights of a Christmas tree. In the spring, Easter celebrates the resurrection of Jesus Christ. This is a foundational doctrine for the sect called Christianity. For me, it offers hope that transcends the life I now live. Easter always falls on Sunday. My family attends church services (as we do each Sunday of the year) and worships the living Savior. Afterwards, we feast on ham and buttered noodles (sacrilegious according to Old Testament dietary guidelines) and play games. Laughter is a staple around our table. As I’ve mentioned in earlier posts on the subject, my favorite holiday is Thanksgiving. Although it is a manmade day, it was founded on the principal of giving thanks to God. Our family shares one thing we’re thankful for as we surround the table laden with turkey, stuffing and all the traditional trimmings. How crazy is it that in a country where the federal government claims eleven national holidays, I consider only three to be “holy days”? One of my holidays isn’t even considered to be a “national holiday” to the U.S. government. Bonus points to you if you can list these eleven holidays and their dates (without checking either your calendar or an internet search engine). Can you do it? Make sure to take credit in the comments if you can. In my family, we celebrate January 1 with food and games. Sometimes a large crowd gathers and other times it is just the four who reside under our roof. In case you’re wondering, this is New Year’s Day, and Uncle Sam consents to call this a holiday (not that I need his approval). Other dates that fall on neither my nor the national register are Valentine’s Day and St. Patrick’s Day. Perhaps these are important days in your world. Aren’t you glad you’re free to observe them – even if you have to call in sick or take a personal day from your place of employment to do so? My family ushers in the barbecuing season on Memorial Day. No, this isn’t what the day is supposed to be about. Most of the time, it is also near my wedding anniversary, so my husband and I have been known to fly the coop together during this holiday. Both my mother and grandmother actually took flowers and visited the graves of people who had passed away on this day. That is a more accurate celebration for a holiday that was originally known as “Decoration Day.” You guessed it. People actually decorated the graves of soldiers with flowers on this day. Some people consider it the beginning of summer recreation (making my barbecuing tradition less blasphemous). For many years, July 4th was a family gathering with a picnic and birthday cake. Not in honor of Independence Day (the official name of the holiday), but in honor of my only niece’s birthday. Now, she’s an adult. We still like to fire up the barbie and the kid’s like to blow money on fireworks. Amidst all off these dates, we have other special days known as “birthdays.” I won’t bog you down with the actual calendar numbers, but our family likes to celebrate these days. I’ve even lobbied for this day being granted as a day off from traditional employment. Around here, I like to make the person’s favorite meal for dinner and whatever sort of dessert they want for their “birthday cake.” My sons believe I’m a terrible person because I stopped wrapping up packages for them on their 19th birthday. Cards and dinners, I’m still on top of that, but why does a birthday have to be about getting gifts? For years, we celebrated Labor Day by going camping. We wanted to get one last hurrah in before the drudgery of school set in for the kids. Now that we’re all finished with school (well, my youngest has one more year of college), we might have a barbecue and play games. My actual list of holidays numbers less than eleven, unless you count the birthdays individually. If you do that, I have eleven special days every year – in perfect harmony with Uncle Sam (well, except for the actual dates and significance). Don’t forget to take the poll. Share it with your friends. Don’t you wonder what they consider the most commemorative days of the year? Does your ideal date include a test drive? A sunny Friday night spent dining with my husband in one of our family’s favorite restaurants. A prefect date night. 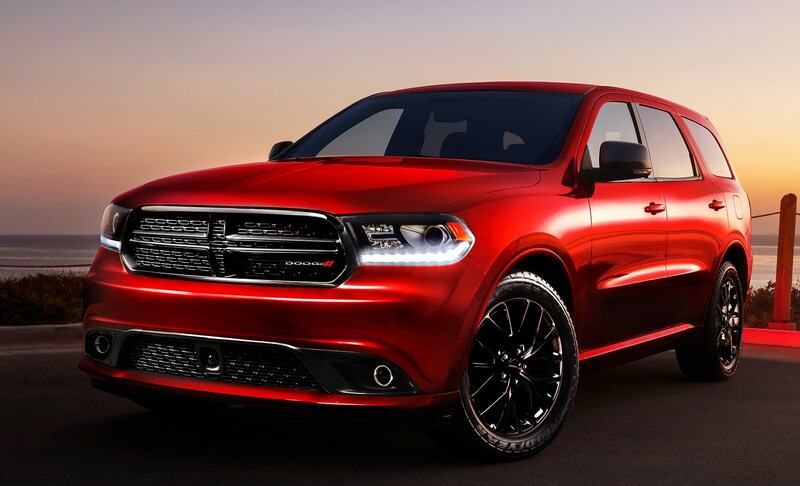 Then comes the suggestion: how about test driving a Durango? Yep. I want the red one. Test driving a car wasn’t on my radar. Until Friday night. I guess that’s what happens when you’ve been married for 26 years. All the other exciting date options have been done to death (*rolls eyes*) so you resort to consorting with car salesmen. It sounds exponentially more horrifying when you phrase it like that. Fortunately, our salesman didn’t feel the need to press us forward. Of course, hubby didn’t drive either of the vehicles we might trade in for the new car either. He knows himself very well. The model in the color I wanted with the options I like was still in transit to the dealership. Darn. I guess there’s no chance of a sale tonight. Hubby drives the car off the lot. He takes it on the highway and punches it. Pretty fair response for a V-6. I’m enjoying the view from the passenger seat – above all the minions in their sporty or economical cars. Eventually, I get to drive sedately down the road back to the dealership. The only reason there’s a blind spot is because of the window sticker. I could be a back-up pro with the reverse camera. Acceleration – check. Braking – ditto. I’m still not sure I want such a big vehicle. I’m happy to whip in and out of tight places with my little RDX. Really, I just wanted to move up in the world to a stellar luxury brand. Do I really want to be that girl? I’m thinking about it. Still. Okay, no, I don’t want to be all about the brand. “I drive an Audi.” “Oh, well my BMW cost more.” “Ha! My Mercedes trumps you all.” You know the type of person I’m talking about. No, I don’t want to be that girl. Of course, the major selling point for the Durango is that it will whittle us down to one vehicle per person in the house. Yes, hubby agrees to let the truck go if we get something that can haul a utility trailer. It’s not every girl that can separate a man from his truck. What’s the strangest “date” you’ve ever been on? For the record, I have been on stranger ones. Like with most things in life, exceptional hostessing is an art of fine degrees. Some women have the gift of creating a warm welcoming atmosphere and fine food, all at the same time. Others are willing to get the book and do the work to make it appear they have that touch. I am neither of those women. In fact, the idea of hosting a large quantity of people, even family, in my home and being responsible for their every comfort sends me into a semi-comatose state. You can find me huddling beneath my covers babbling nonsense. Over the years, I’ve gotten better at hiding that reaction. Still, it circles like a vulture over the corpse of my first failed attempt at being a hostess. I was a young wife and younger mother. My husband and I had three other couples over to our 1200 square foot home. I was preparing a fine dinner (and I didn’t even know what that meant). For weeks, I had combed through recipes in the volumes I owned. (Yes, before the days of Google searches, we thumbed through books). I found an exceptional recipe for an appetizer and a savory sounding meat glaze. The sweet and sour chicken wings were labor intensive. There was double dipping in egg and flour and basting during the extended oven time. I made them in advance, and was pleased by their appearance. My husband gave the thumbs up after tasting one. The glaze for the pork chops took some time and effort, but I could taste test it along the way. It seemed appropriately tangy with a little sweetness. I set the oven to 400 degrees and scrubbed the potatoes. I opened cans of green beans (don’t frown; I sprinkled them with freshly crisped bacon bits and minced onion). All seemed in order. People arrived. Laughter mingled with the succulent smell of roasting pork. Everyone snacked on the wings, licking their fingers. It boggled my mind: finger-licking good chicken – that I made from scratch. Dinner time arrived. I set everything on the table. Guests gathered round, passed the dishes and served up their plates. I picked up my fork and knife to slice open my baked potato. I had all the necessary toppings lined out in pretty crystal bowls: sour cream, butter, chives, bacon bits. Rather than a rush of steam, resistance and a decided crunch greeted my utensils. I pushed open the clamshell halves and noticed the middle of the potato had a wet sheen. I poked it with my fork without satisfactory results. Perhaps I was the only one whose potato wasn’t cooked completely. *Shakes head* Such an innocent, still prone to wishful thinking. The obligatory compliments began as everyone sampled their food. The pork might have been slightly dry, but the flavor was exceptional. Green beans are so much better with bacon. And on and on. “I like my potatoes crunchy,” one of the men said. To demonstrate his honesty, he sliced off a chunk and popped it in his mouth. What was that sound? Was he eating potato chips? My appetite fled along with any desire to ever cook for a group of people again. At that moment the idea of eating anything plagued me worse than morning sickness. Needless to say, I have cooked for people from my husband’s office (nerve-racking to the ultimate), visiting evangelists (you expect preachers to be polite) and large family gatherings. Every time I experience the same panic beforehand. At least for Thanksgiving dinner this year, I knew what food was on the menu. Of course, my turkey baking skills are mostly limited to turkey breasts, since that is what my husband prefers. Fortunately with a few keystrokes, I can Google “easy turkey roasting” and find a bevy of step-by-step instructions, complete with photographs. Some of them even have videos. Being a great hostess is a mite easier these days. I have yet to master the art, however. I can’t imagine Martha Stewart looking to Google for help. I know my mother in law, hostess extraordinaire of the authentic kind, uses the Internet from time to time, but mostly to add something new to her tried and true. What I enjoy about Mrs. Hughson is that she can sit and visit with her guests or work them in the kitchen with the confidence of a professional. If something is done early, she never panics. She makes plenty of food (enough for the entire county) so there’s no worry folks will go hungry. What do you think makes an excellent hostess? Is it the food or the atmosphere that you believe takes the most skill to master?